Neon Genesis Evangelion broke new ground as an anime and has amassed a huge cult following since it first aired and now you can join the many Otakus around the world that have embraced Evangelion as the true classic that it is with this Rei Ayanami figure. Hailing from the Deformation Maniac Figure Collection by Banpresto, this delightful figure stands 6″ tall complete with a stand that you can plug her into for easy displaying in any room. The base is a hexagonal shape, see through in design with some circuit art etched into the base stand itself. 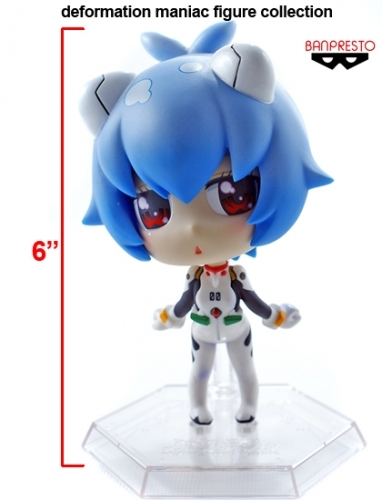 The figure features a huge bobble head that sits nicely atop the body of Rei wearing her ever popular plug suit from EVA. Really awesome work on the colours with no discernible colour bleeding or fading. They’ve done a fantastic job of essentially shrinking her down to size but yet keeping a good deal of detail on the suit. The pose itself is very cute and childlike as she’s holding her arms back with her chest sticking out, very cool. Her head is a real show stopper with her big red eyes, excellent paint work on the eyes showing off the shine to them, little button nose and barely open mouth conveying a sense of innocence and fragility that Rei brought to the series. Her hair is a beautiful shade of blue with a tie at the back and the synonymous transmitter plugs at the the top of her head. To be completely honest, the only thing I can find fault with, and this is being really picky, is that I had some difficulty in attaching the figure to the stand itself as the plugs in her feet didn’t want to quite match up with the holes in the base. But that’s just pulling hairs really as this figure is quite striking, unique and a must for Evangelion and figure collector fans. Pick it up today from Otaku Fuel. This review also published on Japandaman Dailies.